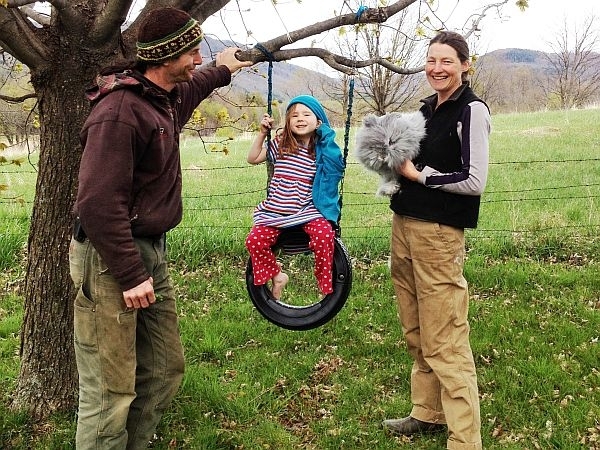 At Full Moon Farm in Hinesburg, David Zuckerman and Rachel Nevitt take a break from checking for onion maggots to help their six-year-old daughter climb a tree in the back yard. In addition to making sure she gets outside, they work hard to keep genetically modified foods out of Addie’s mouth. "We bought a bag of organic lollypops at the coop," Zuckerman said. "If Addie comes home with candy from Valentines Day or a birthday party or whatever, we trade to keep the GMOs out of her. So she isn’t denied sugar and sweet. But she doesn’t get all that corn syrup." Zuckerman and Nevitt were very vocal in support of the GMO labeling law that stalled recently in the House judiciary committee. And Rachel Nevitt says there’s one word for how she’s feeling: "Furious. I’m furious because it’s an issue that’s really important to a lot of people; we’ve made that really clear. We have a right to know what’s in our food. Period." Nevitt’s not alone in her anger. Four separate polls found that more than 90 percent of Vermonters support requiring labels on food made with genetically modified seeds, reflecting the national trend. "The problem is that we’re quite confident that we would be sued right out of the blocks," said Vermont Secretary of Agriculture Chuck Ross. "This is an issue that would be best dealt with by Congress with a national standard. It’s being looked at by other states but they run the same risk that the state of Vermont does in it being a suit. And that’s a costly proposition to engage in." Vermont lawmakers worried that Monsanto and other large multinationals would make a case that requiring the labeling is illegal. Monsanto says it did not weigh in on Vermont’s deliberations. But while Vermont’s bill won’t be going any farther this year, close to 20 other states are still considering GMO labeling laws. In California there’s a petition to make it a ballot initiative this November. And the Food and Drug Administration received a record-breaking 1 million public comments on a labeling petition from an organization called Just Label It. The FDA recently said it couldn’t reach a decision on that petition and needed more time. But in the past, it’s said that such labeling could "create the impression that the labeled food is in some way different" and that that would be false or misleading. Supporters point to labeling laws throughout Europe and say it’s just a matter of time in this country before the public desire to know what’s in our food will win out. Under a bill gaining support in the Statehouse, Vermont could be the first state in the nation to require labels on products made with genetically modified crops. Lawmakers are now trying to craft the measure so it can withstand an expected court challenge. Grants from the Rural Energy For America Program will be used by maple syrup producers to make their operations more energy efficient, utilizing reverse osmosis technology.